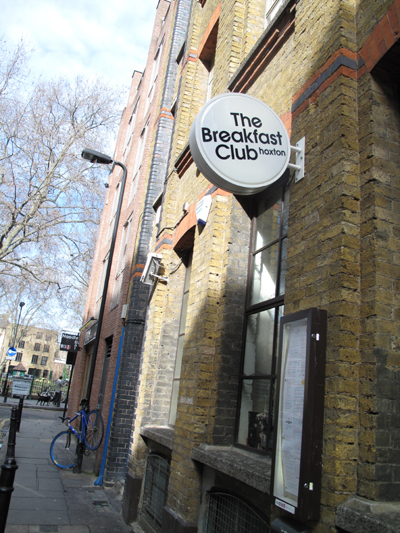 There’s a real buzz emanating from Hoxton’s The Breakfast Club which you can feel just from standing outside in line. I’ve walked curiously past this Shoreditch institution many a time since I moved to the East End, never failing to be impressed by its witty concept. However, I’ve never actually gotten down to going inside and committing the act itself. Having overkilled Modern Pantry and Spitalfields’ TheLuxe far too many times over the past 12 months, it was about time my Sunday Brunch had a slight change of scene… and with Jin raving on non-stop about their Eggs Benedict, it was time to finally join the club for a properly guilty breakfast catch-up, ex-flatmate style. The place is actually a lot more spacious on the inside than it looks from the exterior and its rather eclectic deco is a little bit American Diner meets Vintage East End Furniture Shop. 60’s black-and-white photography and chess-board tiles blended in with technicolour parasols and worn-out brown leather sofas. Given it was 12.30pm-brunch-prime-time, PleaseWaitToBeSeated for 15 minutes we did. 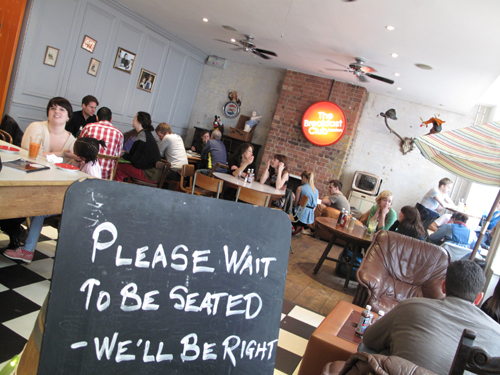 We were eventually seated by the lovely but extremely busy staff on a pair of vintage lazy-boy arm chairs in a cozy corner of the cafe… our expectations managed upfront regarding the wait for food, which we were told could take up to 20 minutes given how swamped they were. I was most impressed with the immense selection they had to offer food and drink-wise… Everything from Pancakes galore to the Classic Full English.. Egg’s Benedict to Huevos Rancheros… Smoothies… Coffee… Cocktails even. Craving a big New York City style breakfast (with pancakes, eggs, sausages, bacon and the works), I went for the All-American. 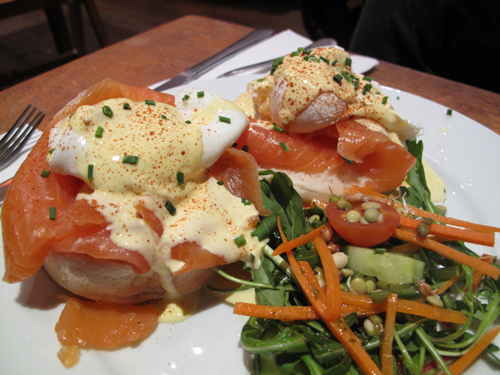 Jin on the other hand opted for the Eggs Royale to quell his Hollandaise sauce obsession. To our surprise, our food actually arrived within 10-15 minutes and comfort food for the gods it was. My sunny-side up eggs were perfectly cooked, yolks rich, fresh and still runny, just the way I like them. The dry-cured streaky bacon and pancakes with maple syrup were absolutely delish and accompanied by a generous slug of hash browns underneath. In fact, we were so busy tucking in and enjoying our own plates of joy that (a) it didn’t occur to us to sample one another’s food (hence I’m unable to personally testify on how wonderful the Hollandaise sauce actually is…), and (b) we were barely bothered that our coffee and smoothie that we had ordered earlier were still nowhere to be seen. We eventually reminded one of the waitresses about the latter who apologised genuinely and ensured it would be made and served as a priority. And judging by the clean plate Jin had at the end, I can only assume his Poached Eggs and Hollandaise tasted as good as it looked. At barely a tenner a head, its a great value brunch worth waking up for that is bound to put a spring in your step for the week ahead. Yes, the service can get a little patchy if you dine during rush hour like we did, but its easy to forgive and forget given when the staff are this friendly and the food is this good and generous. It’s no wonder the franchise has been voted Runner Up in the Oberserver Food Awards for Best UK breakfast (only behind to The Wolseley of course). I’m already looking forward to trying their Soho and Angel branches. I haven’t been to the Breakfast Club, but you had me at huevos rancheros. I wonder how their version is . . . was your bacon crispy? It doesn’t look it from the photo, but it’s hard to tell. Nice to hear about good brunch places! I’ve always wanted to try the one in Angel, but the queue is always ridiculous by the time I get there! And because I am hungry I inevitably head somewhere else. Suyin: The Wolseley’s food is v.v. 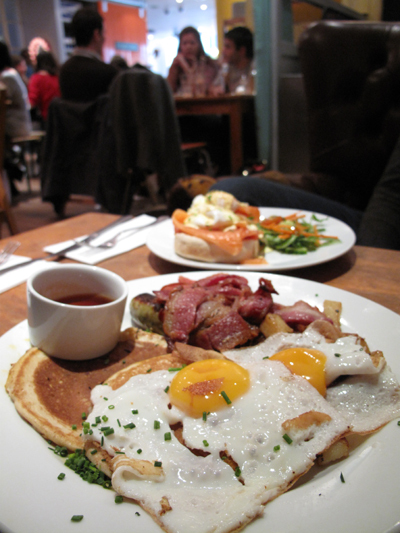 good, but i find it a little on the posh/stiff side for an informal wind down weekend brunch! (in fact I’ve only been there on business/client breakfasts so don’t know what the feel is like on a saturday or sunday brunch). 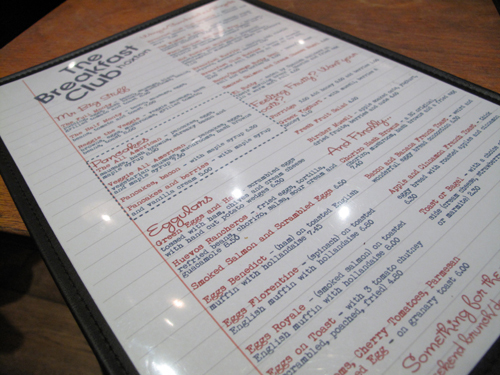 Lantana’s brunch menu looks amazing and the sort of thing i’d love (Baked Eggs with Chorizon!! )- will let you know how it is if we’re ever in the area.